Two entities are disputing the ownership of the domain name “coralgardens.com.” The domain name is owned by Reef Residences Management Ltd., a company that manages short term rentals for the Coral Gardens condominium resort in the Turks and Caicos Islands, British West Indies. The Proprietors, Strata Plan No. 36, is the homeowners association for the Coral Gardens property. The parties have thus far engaged in a number of actions, but the one relevant here is that Strata filed an in rem action against the domain name in federal court in Illinois, claiming a violation of the Anticybersquatting Consumer Protection Act. 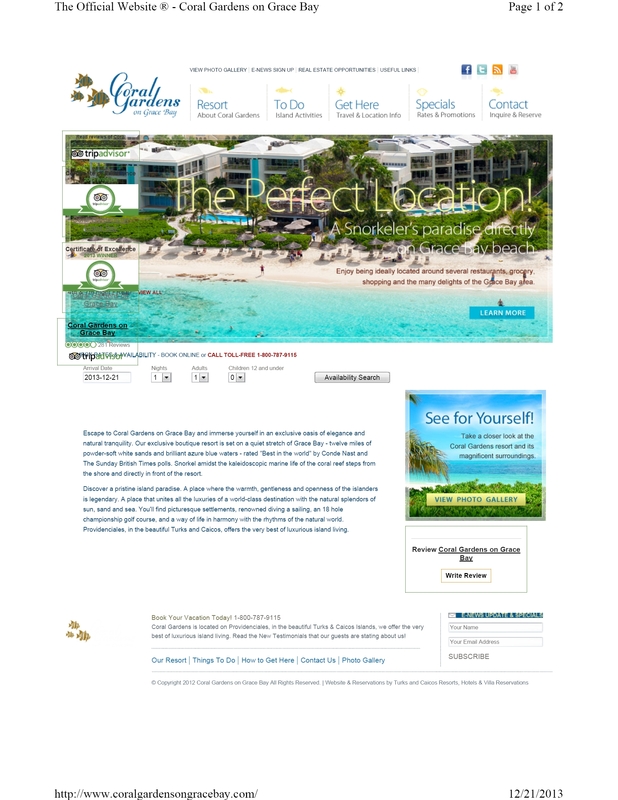 Strata’s claim was premised on ownership of trademark rights in CORAL GARDENS based on a registration in the Turks and Caicos Islands and a US registration. In response, Reef Residences filed a petition to cancel the Strata US trademark registration. The Illinois district court then stayed its action to wait for the outcome of the cancellation action. The homeowners association had registered the CORAL GARDENS trademark for “real estate management of condominium complexes” in Class 36 and for “providing temporary lodging services in the nature of a condominium hotel complex” in Class 42. The registration was more than five years old, so was susceptible to challenge on only a limited number of bases. Reef Residences challenged the registration on two theories: that the trademark had been abandoned and that it had been procured through fraud. The Board decided the case on abandonment and so did not reach fraud. The US application was registered under Section 44(e) of the Lanham Act, based on ownership of the Turks and Caicos Islands registration. However, a registrant under 44(e) still has to use the mark, and non-use for three years is a prima facie case of abandonment. Reef Residences claimed that Strata had never used the mark for the registered services. However, the website was owned and operated by a different entity, Seagate Management Company. Strata hired Seagate to manage the common property of the condominium association and Seagate also provided property management and rental management services to individual condominium owners. These latter services weren’t offered by the condominium association itself, although they were mentioned in the agreement between the two. I see the first question as what “real estate management of condominium complexes” means—if we don’t know that, then we don’t know whether the mark is in use. (I’m skipping “providing temporary lodging services”; it was clear that the homeowners association had nothing to do with property rentals, so I don’t disagree with the opinion on the Class 42 services.) Second, once we’ve identified what the services are, the questions is who is performing them, Seagate or Strata. Does a condominium association provide “real estate management” services? I would say yes. Strata’s bylaws said that the association’s duties were to “control, manage and administer the Common Property for the benefit of all Proprietors.”1 A homeowners association is responsible for landscaping and lawn care, for pool maintenance, paving, and so on. I think that is real estate management, and they have outsourced those task to Seagate. But the Board didn’t look at it in this way. Notably, nothing in the Management Agreement establishes that Respondent has control over or involvement with the rental or management of the condo units or providing temporary lodging. Neither does the Management Agreement set forth any requirements, obligations or activities for Seagate in connection with the rental or management of the condo units or temporary lodging. But is that what “real estate management services” means? Why can’t it be the management of the common property, services that the Board acknowledged were provided to Strata by Seagate? The Board instead elided the two services, assuming the description applied only to management of units, not the Common Property. As to Seagate’s role, the Board reviewed the management agreement and concluded that Seagate didn’t have a trademark license to use CORAL GARDENS. But whether Seagate is a trademark licensee isn’t the legal question; the word “license” is not used in the statute. The correct question is whether Seagate is a related company whose use inures to the benefit of Strata. Where a registered mark or a mark sought to be registered is or may be used legitimately by related companies, such use shall inure to the benefit of the registrant or applicant for registration …. any person whose use of a mark is controlled by the owner of the mark with respect to the nature and quality of the goods or services on or in connection with which the mark is used. A licensee may be a related company, but not all related companies are licensees. The Board said that Strata didn’t control Seagate with respect to managment and rental of individual units, which may be true enough, but it didn’t examine whether Strata controlled Seagate’s management of the common property. Presumably Strata did; presumably the homeowners association didn’t completely abdicate all responsibility for the maintenance of the common areas, collecting dues, budgeting, obtaining insurance, and other responsibilities once it hired Seagate. So between a questionable interpretation of what “real estate management services” are3, and a failure to correctly apply the law as it relates to use of trademarks by others, particularly when that use inures to the trademark owner, the Board concluded the trademark was abandoned. But it’s not abandoned; it is a trademark and someone is using it. Recall the (long ago) introduction to this post, and that this trademark application is the basis for a cybersquatting claim in federal court. This poorly considered opinion, if not challenged, means that Reef Residences will win its ACPA claim too. And an interesting practice point: § 44(e) allows registration of a trademark based on ownership of a registration from certain foreign countries, those that are treaty members, most often the Paris Convention. Turks and Caicos Islands is not a member of any treaty country for purposes of § 44(e). Therefore, the application should not have been granted registration under § 44(e). In fact, the Registration Certificate for the Turks & Caicos Islands says on it “This certificate is not for use in legal proceedings or for obtaining registration abroad.” However, because the registration was more than five years old, this flaw could not be a basis for challenge. Reef Residences Management Ltd. v. The Proprietors, Strata Plan No. 36, Cancellation No. 92059352 (Sept. 14, 2018). One Response to What Is the Mark Being Used? Maybe this was discussed elsewhere in the proceedings, but I found it interesting that the original application recited “Real estate marketing services in the field of condominiums” prior to being issued an Office Action saying that was an unacceptable recitation. A subsequent Response to the Office Action was entered reciting seemingly broader services, followed by an Examiner’s Amendment (presumably after some sort of phone conversation) where “Real estate management of condominium complexes” was entered. Funny that the addition became a point of focus the way it did.